At the last UDS there were some discussions about some of the things people wanted to see in the LoCo Team Portal. Unfortunately it quickly became apparent that while there were plenty of ideas, there is only one active developer, with just a couple others who pitch in with fixes. In short, we need more developers if we want to see more features and improvements to the directory. I’ve started taking a look at a couple of bite-size changes, but I’m just learning Django and my time is quite limited. It would be great to have experienced folks pitching in. The other day I worked with Michael Hall (mhall119) and Adnane Belmadiaf (daker) to get the development environment up and running on my 12.04 desktop. During the process daker checked in a change for a bug I ran into and now by using a nice Makefile it’s pretty easy to get going on 12.04. However, since then, daker has changed the process a bit to make it even easier to get going by shifting to using Vangrant to set up a virtual machine for development. Now for the hard part, fixing bugs and adding features! You’re in luck, as part of the Ubuntu Global Jam this weekend, daker will be hanging out in #ubuntu-website on and off (so be patient!) from 11:00 to 22:00 UTC over the weekend. He can help with whatever questions you may have from installation to tips on how to write Django-focused Python. 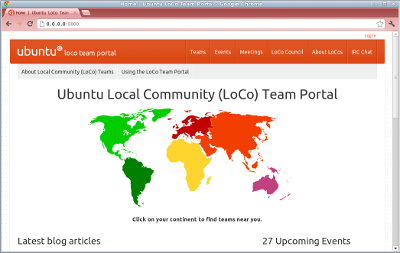 This entry was posted on Friday, September 7th, 2012 at 2:47 pm and is filed under LoCo, tech, ubuntu planet. You can follow any responses to this entry through the RSS 2.0 feed. Both comments and pings are currently closed. Interesting idea. Get loco teams togeather to work togeather worldwide. Please forgive me for off-topic comment, but I saw you installed U 12.04 on Lenovo G575. I was considering buying that laptop for that very purpose. Would you? And does the wi-fi work without tweaking? 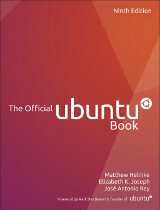 Thank you for your work on Ubuntu. But it’s strictly related to Network Manager, when NM scans the network regularly, it gets very slow and sometimes disconnects. I replaced NM with wicd and it works great. Keep hoping for a fix in a new kernel though. Everything else works very well. Thank you for your answer! I am running Ubuntu 12.04 on a Vaio desktop and a rather old Compaq desktop without trouble but am leery about laptops and wifi. I want to fix many bugs, new features. Problem is in time to review new patches. I send my patch in July and still waiting for a review. Can you send me a link to a couple of your patches? I gave daker a nudge and he’s going to try and review this weekend. Thanks! Ok :) I am going to find some other bug and to fix it. Ris, the problem is that there is really only one active developer right now, and he is very busy with other things too.. I try to help him out where I can. If you start submitting more patches I believe you may be able to ‘light the fire’ and help him get development started back up. If you continue to submit good packages, I am sure that you will very quickly be added as a ‘core-dev’ to the code and be able to help out further with reviewing other peoples code. Yes. I understand it very well. I have no claims. No offense. Entries (RSS) and Comments (RSS). 32 queries. 0.095 seconds.